Today was a beautiful, balmy (albeit November) day, the sort of day that it just seems a shame to stay inside and work. Dan suggested that we take Raven over to the park for a hike at lunchtime, hopefully to tire her out so she’d sleep for the afternoon. We thought perhaps we’d go check out the Arkon Lake Ring Bog, which is marked on the Frontenac Provincial Park official map with the caption, “a typical acid bog plant community, with black spruce trees – the typical tree of northern Ontario.” It’s true that in my travels through northern Ontario, particularly north of Superior, the predominant tree species becomes black spruce, and it really defines the region to me. I really like bogs and their unique flora (sundews are my favourite), and so the combination of features appealed to me. 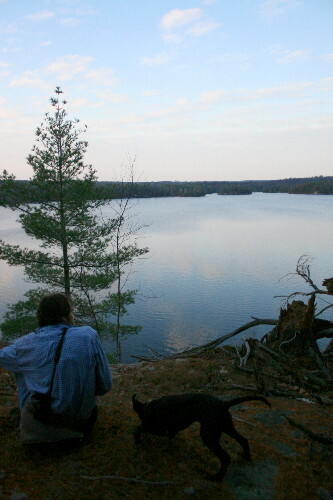 We crossed Birch Lake and pulled the boat up on the shore. We picked up the trail and followed that a short ways before Dan tired of being directed where to go, and we crossed over a ridge to check out a beaver pond. We picked up the trail again and followed that for quite some distance. The problem with trails, however, is that it’s a little like being the passenger in a car. While you’re traveling cross-country (or while you’re driving a car) you have to pay attention to where you’re going. However, if you’re following a trail (or sitting in the passenger seat) you can kind of tune out and just let the driver (or trail) take you along. And that happened here. We followed the trail, admiring the scenery but not paying close attention to our bearings, and eventually we began to wonder why we hadn’t come across the bog yet. We paused and tried to figure out where it should be relative to where we were then. We thought perhaps we’d passed by it, and it was back to the northeast. Dan climbed up to the top of a ridge to look around, and we decided to cut across country in the direction we thought it was. Foolishly, we hadn’t brought the park map with us. Neither of us had closely examined the map before leaving – Dan knew approximately where it was relative to other landmarks, but had thought it was right on the trail; I knew it was off the trail but had no idea where it was relative to landmarks. Neither was much help once we found ourselves away from any recognizable landmarks to navigate from. Turned out we just missed it; if we’d kept on going along the trail instead of cutting off when we got impatient we may have been able to see it from the trail’s edge. And we didn’t miss it by much – only 300 meters or so. So that was a bit disappointing. We’ll have to go back on another visit, and perhaps park the boat a bit closer so we have a better idea where we are. Plus take a map. We did get in a good hike, though. When we got home and looked at the map, and estimated the approximate route we’d taken, I figured it to be about 9 km (5.6 miles) total distance. It took us about 3.5 hours, which was a bit longer than the lunchtime hike we’d planned on. You’d think that this much walking would have worn Raven right out. Dan and I were dragging our feet, ready to go home for a nap, and we both needed a good long drink (having not wished to tote along the weight of water, but also not expecting to be long as gone as we were). Raven, on the other hand, had been stopping to sip from the various water sources we encountered, so wasn’t thirsty, and was still bounding on ahead with all the apparent energy she’d started with. I’d been expecting that after that long hike she’d sleep the rest of the day off, but she napped for an hour or so, then was ready to play again. Boy. I wish I knew where she got all her energy. Maybe I should start eating dog kibble. 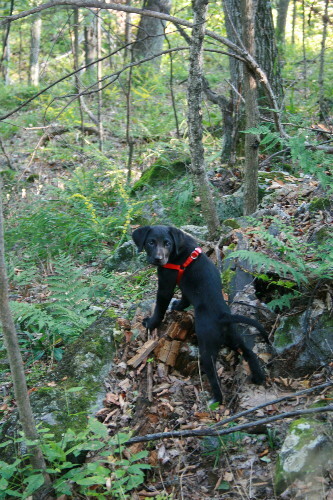 (Here Dan breaks for a rest on the home stretch of the trek, while Raven plays in the pine needles). 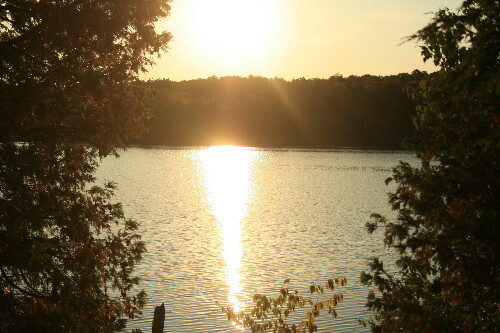 Frontenac Provincial Park, like many provincial, state and national parks, is a park of postcards. Over virtually every ridge, or around every turn of the trail, there’s a panorama worthy of a postcard, or at least a professional photographer to do it justice. I snapped many photos while we were out, but they never seem to capture the feel of the place the same as when you’re standing there taking it in, even the panoramas. I also find that the camera dulls the colours of the scene, and when I get home and edit the photos I virtually always bump up the saturation to try to emulate what my eyes saw. The eye is an amazing thing, really, in its ability to appropriately adjust for different lighting conditions within the same scene (eg dark forest floor, bright sky behind), and enhance the colours. Even the expensive cameras are good, but still just can’t do the same thing. I look forward to seeing this place in the summer. In some ways it was good that we moved in to the house at the end of the breeding season so that there was less to distract us as we were getting settled and trying to adjust to the new work routine. 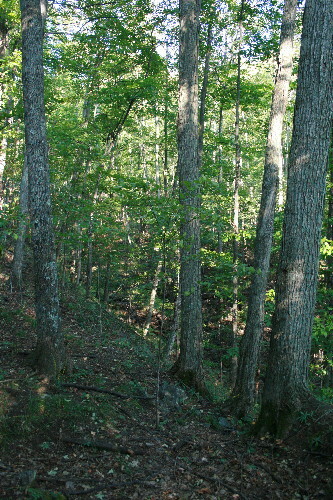 But on the other hand, I was disappointed that we missed all the birds, and will have to wait nearly a full year to find out what inhabits these woods. We moved in in August – the breeding birds will return and start setting up territories in May and June. 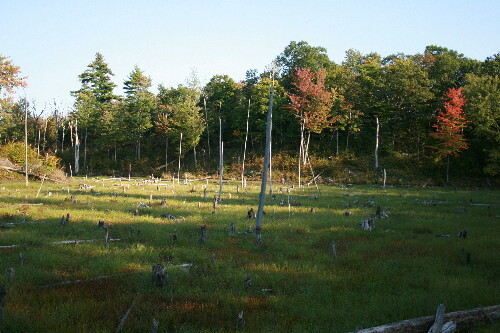 Some of the most intriguing habitats are the marshes. We came across one huuuuuge marsh, that stretched for perhaps almost a kilometer, that should be excellent habitat for all sorts of species. Most of the marshes and wetlands I’ve had experience with have either been small, or have been degraded by city pressures. This might be the first very large marsh I’ll get to check out that’s fairly pristine. I’ve been to the large ones at Point Pelee and Long Point, which are also really large, good-quality marshes, but I’ve only visited them in passing, briefly. We’re hoping for Marsh Wren, Wilson’s Snipe, Common Yellowthroats and Swamp Sparrows, Sora and Virginia Rails, maybe coots or moorhens, perhaps King Rail or Sandhill Crane (which have been recorded nesting in neighbouring areas) if we’re very lucky. The trails themselves are not very well-developed. They’re barely more than deerpaths, single-file packed-earth depressions. 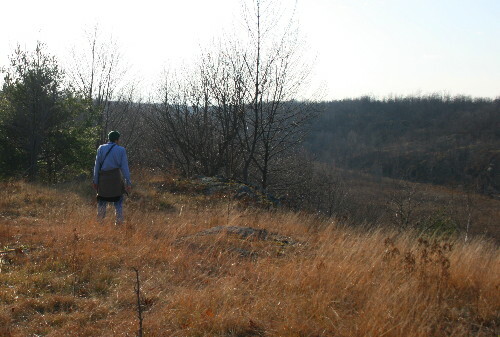 Some, the more frequently-traveled trails that hook up with parking lots or campsites, the leaves that have fallen on the trail have been broken up by the feet that have passed over them, but others, such as the one that would have taken us past the ring bog, the leaves were mostly intact. There are trail markers for the winter when the depression is hidden under snow, and trail signs where two or more trails intersect. These are all in good condition, but are unlikely to degrade in the weather too much. 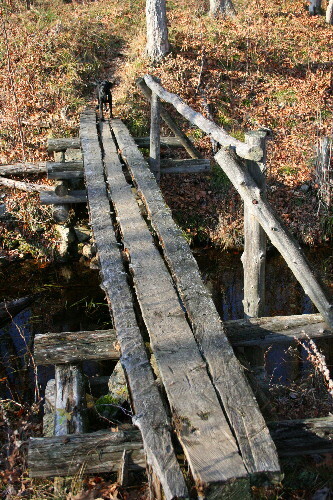 Many of the bridges, however, are a little worse for wear. The ones along the main trail are in good shape, but the ones on the side trails could use some repairs. Such as this one, which was pretty much unusable. We skirted around, jumping from grass-tuft to grass-tuft to cross the little trickling creek. Raven, who wasn’t opposed to getting her feet wet, just splashed right through. Speaking of bridges, we encountered this one, one of the few that was in good shape. Dan and I crossed it without thinking, but behind us Raven stopped dead in her tracks at the edge. Dan and I stood on the far side, trying to coax her across, and she stood there and whimpered. I tried walking halfway across, and then most of the way across and calling to her, but she would. not. budge. Eventually I picked her up and carried her across. 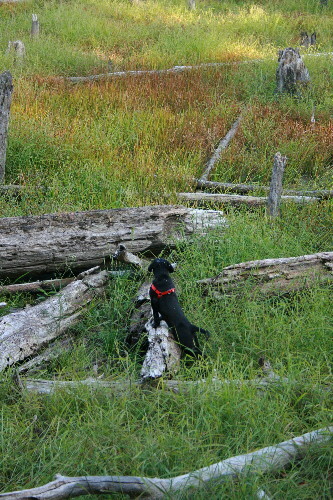 I’m sure if we’d kept going up the trail and out of sight over the ridge she’d have got so desperate she would’ve either crossed the bridge or scampered through the stream it spanned, but I didn’t like to let her out of my sight in that sort of setting. What if she didn’t, and panicked and took off? Easier to carry her. I’m not sure what it was about the bridge that scared her so, there were others with large cracks like that that she easily bounded across. By the time we made it back to the boat, the sun had sunk below the horizon, and clouds had rolled in to mask the sky. 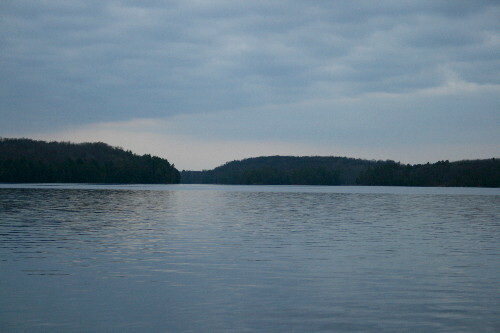 The wind had also dropped, which made the boat ride back across the open lake a bit more pleasant. We hadn’t anticipated being gone for so long, but it was a good hike nonetheless. Tomorrow, some of the things we saw along the way. I’ve become more familiar with our immediate surroundings now that I’ve started going for regular walks with Raven. Although I’ve only walked about a kilometer to the south, I’ve gone about two and a half to the north along our road, and the same distance along a side road that branches off from it. I know where all the houses are along these stretches, which ones have year-round residents, which properties don’t have buildings at all. As I was walking Raven with my mom last week, we passed this one, which she commented on. 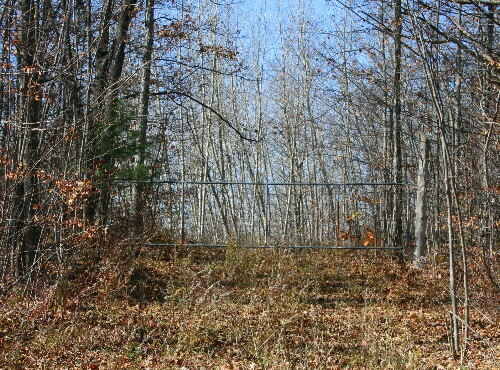 It’s a simple gated driveway, but the driveway itself is all grown over with knee-high weeds to the point where it more resembles a linear clearing than a driveway, and its connection to the road and the gate going across it are all that identify its past purpose. Mom asked if I’d wandered around down there, and I said no, of course not, it’s not my property. But after a few more pass-bys, my curiosity got the better of me. Okay, I admit it – I trespassed onto someone else’s land. But it was vacant, and obviously hadn’t seen vehicular traffic in ages, so I wasn’t worried about the owners finding me there and getting upset. And I was curious. 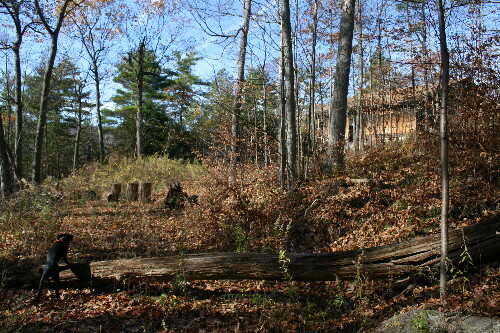 I knew the property must stretch back onto the lake, and I wanted to see what some of the surrounding landscape was like. Aside from the park immediately across from us, though, and one small 2 acre parcel that’s vacant and for sale, we haven’t wandered through any of the forest that neighbours us. So yesterday I stepped around the gate and headed down the lane. The driveway beyond was in the same state as that before the gate, overgrown by goldenrod and raspberry canes, and with downed branches that gave me the impression that it hadn’t been used in at least a year, perhaps two. 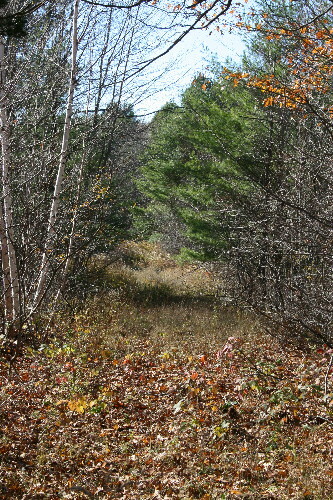 Not far down I found a patch of evergreens. Coniferous trees are conspicuously lacking just half a kilometer down the road in the area around our house, but here they were reasonably abundant. Mostly white pine, it seemed, but there were some cedar in an area of wet ground that the driveway passed, and a few hemlock scattered in. I love coniferous trees, and miss having them around the house here (there are a handful of little saplings that seem to have been planted in the yard a few years ago, but they hardly count). Just that discovery alone made me like the place. Generally speaking, by this time of the year I tend not to use the word “beautiful” to describe forests, but the property was beautiful, and held so much potential for the return of leaves in the spring. 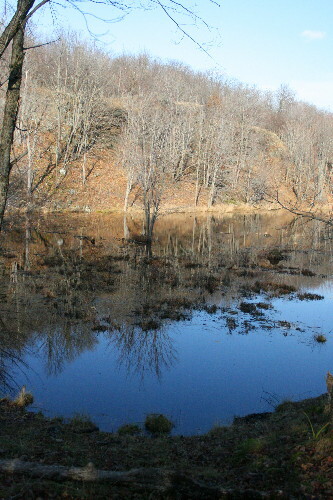 A small creek cut across the property, and though the water level was low, it was still running. Hemlocks and cedars lined portions of it, and mossy stones made the water trickle lightly in others. 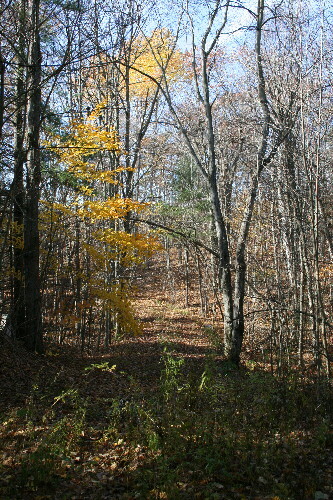 The landscape of the surrounding property was rolling, and many of the beech trees still held their bright yellow leaves, lending colour to the now mostly gray forest. 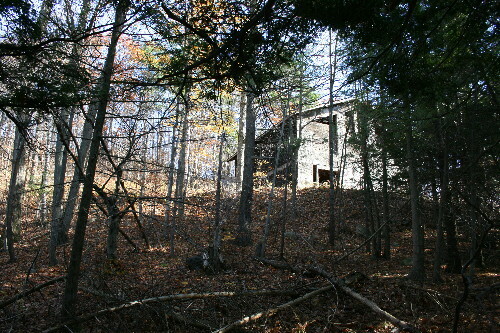 As I neared the end of the driveway, I could see a building hiding behind some trees. 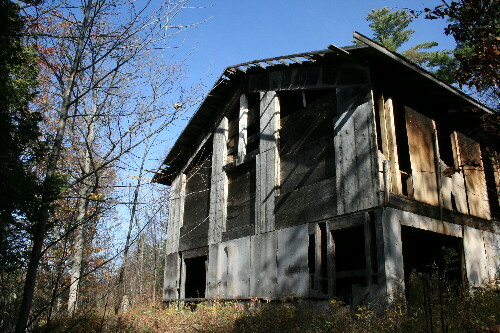 At first its darkened sides looked like it had perhaps suffered a fire, and was now abandoned. That would explain the disuse of the driveway. Right near the house a couple of large trees had come down across the driveway, and were old enough to be starting to decay, but hadn’t been removed. Underneath one, protected from the clutter of falling leaves by the large trunk, I could see gravel, suggesting that the driveway had actually been surfaced at one point. The house hadn’t been in a fire, it turned out, it was just weather-worn. It looked like the owners had begun building it, got as far as getting the frame completed and a roof on top, and then ran out of money. There were cement pilings with rebar set into the ground around the front that looked like they were intended to support a deck. All the windows were boarded up, but you could see where they were intended to go; the front of the house was designed like a Viceroy home, with big windows opening into a vaulted living space, perfect for looking out over a vista such as a lake. Inside it was a bungalow design, with a big, open living space and a couple of bedrooms framed in in the back. The washroom and kitchen hadn’t yet been laid in, so I wasn’t sure where they were intended to go. They had put siding up to protect it, but it had been so long since anything had been done that some of the boards had come off, or been broken. The top boards from the front windows were missing (or had never been put in place), and when I peered inside, I could see whitewash across the floor; evidently crows or some other large birds had been perching in the windows. To say I was enamoured with the place is an understatement. The land was beautiful. And there was so much of it. When I returned home after I looked up a map of our district that included property lines. Based on this, I figure the house includes about 15 acres. It faced out onto a quiet lake – although there was no provincial park on the other side, neither were there any houses, and the same district map indicated the far shore consisted of just three properties. And the house has so much potential. (Nina of Nature Remains recently coincidentally mentioned that that was the word they kept repeating upon discovering their own home in the woods.) It reminds me of buying the puppy – someone else has gone through the planning and first early stages, but you take over it young enough to shape it and make it completely your own. I can envision that great room finished, with bright, wide windows overlooking the lake, a fire roaring in the woodstove in the corner. I’ve totally fallen head over heels in love with the idea of this place. Okay, so it’s all pretty much in the realm of fantasy and daydream right now, but boy, how I would love to own that place and finish it up. There were lots of birds about there. Mostly chickadees, which seem to be ubiquitous even after most other birds have cleared out (this one seems to have dropped a couple of tail feathers and is in the middle of growing in replacements). With them I found a number of other species. Red-breasted and White-breasted Nuthatches were usually in the flocks, often several together. One flock had a couple of Golden-crowned Kinglets traveling with them. Kinglets are later migrants, but I was still surprised to see them there. Some do actually stick around southern Ontario in the winter, where there’s enough food. They tend to favour conifers, and I found this group in a patch of hemlock along the creek edge. Still, they’re such tiny, delicate little birds, it’s amazing they can weather the cold so well. 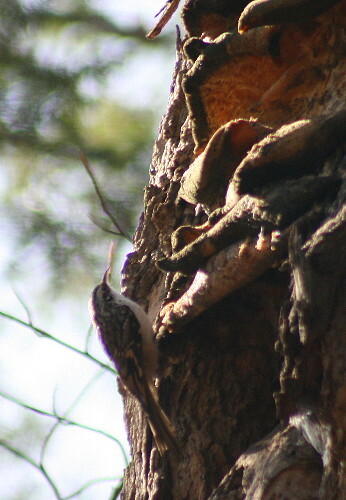 Also a few Brown Creepers, I think I counted four total. Creepers, like kinglets, are small birds that I tend to think of wintering further south but that do stay in Ontario in small numbers over the winter. They get their name from their habit of creeping up the trunks of trees, peering into crevices, looking for food. 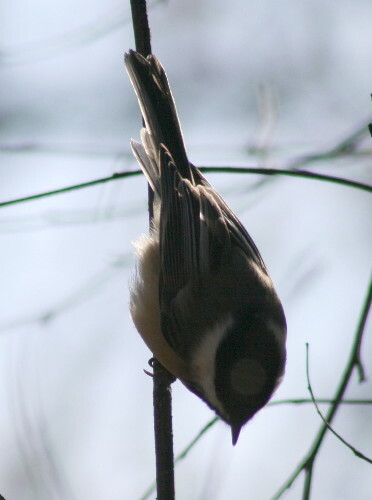 It’s an interesting evolutionary process, complementing that of nuthatches, which crawl downwards on trunks, head first. Nuthatches find all the prey in the cracks as they go down, and the creepers find all the prey on the other side, going up, that the nuthatches miss. This one’s checking out some Shelving Tooth fungi. I saw a few woodpeckers, too, mostly Hairys. 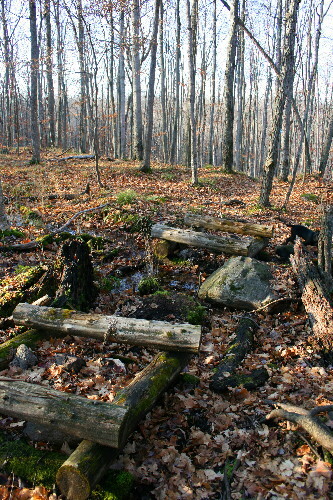 Lots of old and downed wood in the forest gave them ample foraging substrate for food. I saw evidence of Pileateds having worked some trees in the area, too, though no sign of the birds themselves. 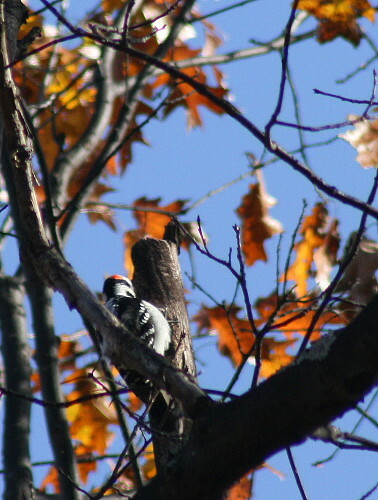 Along the driveway I flushed a Ruffed Grouse that was wandering underneath the pines, there were Canada Geese on the lake near the shore, and a group of Blue Jays calling from the trees near the house. I was surprised by the amount of bird activity I encountered, outside of the presence of any feeders. Infatuation with the property aside, it was a lovely walk, and a whole lot nicer than hiking along the road. I’m toying with the idea of contacting the land registry office for this region to see if I can find out who owns it, to ask for permission to hike there regularly. I had plans to post about fungi today. Not going to happen, but hopefully tomorrow. My sister was up to visit this weekend, which was really nice, I haven’t seen her in a couple months, since well before we moved out here. She left early afternoon, and I spent the rest of the afternoon watching one of the football games. When the game ended, Blackburnian suggested we boat over to the park to take Raven for a hike, so we bundled everyone up and headed out. The outing didn’t go quite as planned; I was supposed to take the trail around and meet up with Blackburnian further down along the shore, but I hadn’t paid close attention to the map before we left, and the trail didn’t do what I was expecting it to. Since I didn’t know how far I’d have to go or how long it would take me to finally get over to the trail I was meeting Blackburnian on, and I didn’t want to get lost, I decided best would be to turn around and head back to the shore where we’d been dropped off. Unfortunately, I wasn’t able to communicate this to Blackburnian, so he was waiting for us at the rendezvous point, and when we didn’t show, started hiking up and down the trail there assuming we got lost (hopefully, as that was best-case scenario). Eventually he did return to the boat and found Raven and I sitting out on the rocks, so it all worked out, but it was dark by the time we returned home. As Blackburnian said when he finally found us, that won’t happen again. In addition to some more interesting fungi I found while we were wandering around trying to figure out how to navigate the trail system, I was also admiring the start of the fall colours. We’re still not quite at peak here, that’ll probably be next weekend, or possibly even the following. But there’s lots that’s starting to show vibrant colour changes. 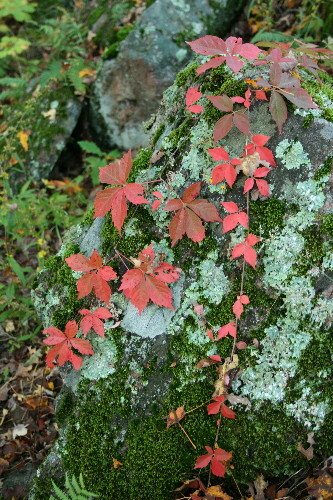 The most striking were the above Virginia Creeper, brilliant red against the aqua lichen and green moss growing on the rock, and the small swamp below, with the yellow ferns and red-orange maple set against the bright green of the pondweed on the water. I’ve noticed both of these (Virginia Creeper and swamp-dwelling individuals) have been among the first to change colour. I’m not sure why the creeper changes colour first, but I think the water cools the roots of the trees in the swamp sooner than those of upland trees, stimulating the earlier colour change (similarly, trees that are at the edge of the forest, or that poke out through the canopy are exposed to cooling winds and are more likely to change before their sheltered neighbours). We had an unexpected guest yesterday, so I ended up not getting a chance to post about the walk in the park. I’d actually just got back from a return trip yesterday, where Raven and I walked another part of it, to find we had a visitor. The last couple of days have been so nice, warm enough for short sleeves but not so warm you’re dying. It just seemed a shame not to take advantage of that. Today was cool and rainy, so I’m glad I went out again when I did. Round trip, we probably walked just over two kilometers (1.2 miles). On a straight and level road that wouldn’t be all that far, but the terrain in the park is far from straight and level. Little mini valleys cut through the granite to create ridges and plateaus. The plateaus are no problem to hike, but the ridges and valleys give you a bit of a workout. 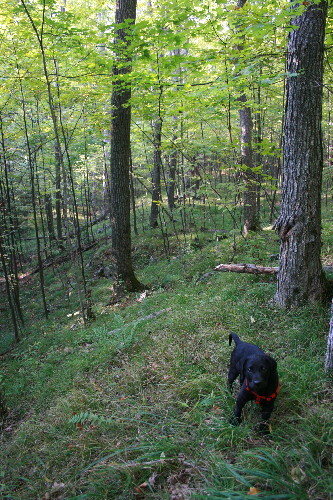 Raven outdid both Blackburnian and I; she was still charging onwards even at the end of the hike. She absolutely loved the outing. We let her off-leash in her harness, but she never strayed far from us, no further than her extendable leash would have let her go anyway. And this way, no wraps around trees! We had no map, no compass, no GPS, and no particular destination in mind. We hiked out towards a promising-looking ridge, and upon cresting that, set our sights on the next. We headed approximately east, but followed the landforms and the suggestion of interesting sights beyond the next valley. There are no trails in this section of the park; in fact, given the size of the park, it’s relatively trail-poor. 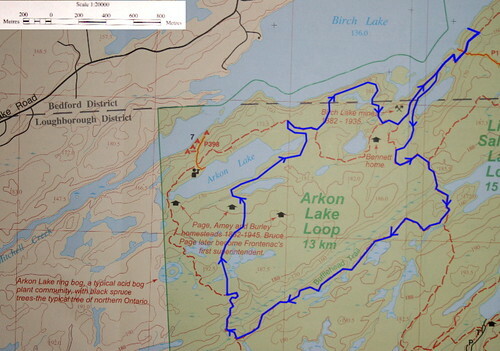 There’s only one trail that’s somewhat easy for us to reach from our lake, and it’s through a campground at the far north end, some 3 km (1.9 miles) away by boat. Not long after moving in, we had stopped by the park office to pick up some maps and get information on the area. We spoke to one of the staff, who indicated that walk-in access to the park is free, and you’re welcome to just dock your boat on the shore and hike in. So we felt no reservations about doing so. So we boated directly across the lake, and docked the boat on a narrow gravel beach where the land sloped gently upwards into the park. It’s been a long time since I explored an area without being confined to a trail, or knowing what’s coming next. Everything was new, interesting, and different. 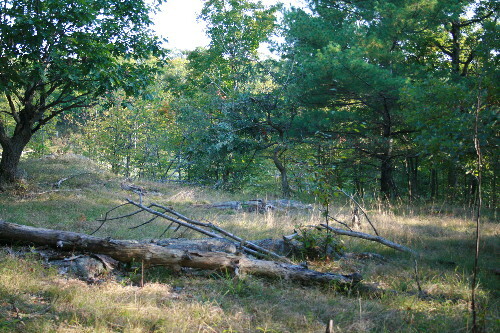 There are an interesting array of habitats within the park. 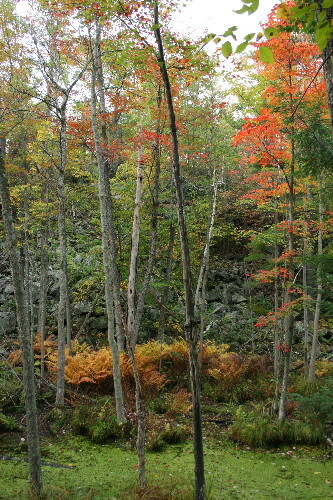 From the shore it looks like fairly uniform mixed forest. 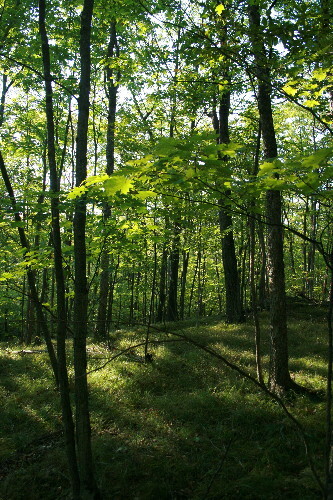 In fact, when you start hiking in, it turns out to be primarily deciduous, at least the sections we walked through. There were a number of more open areas that resembled oak savannah, though I don’t know if they had quite the combination of characteristics to qualify as such. There were also a few low, wet areas that were obviously flooded at certain times of year, but not currently. Fallen logs, soft and decaying, were covered with moss and ferns. 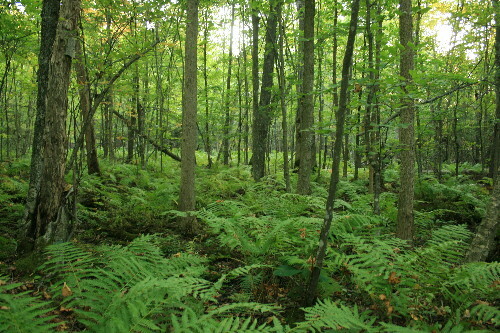 The area had a very lush, green appearance because of the ferny understory. 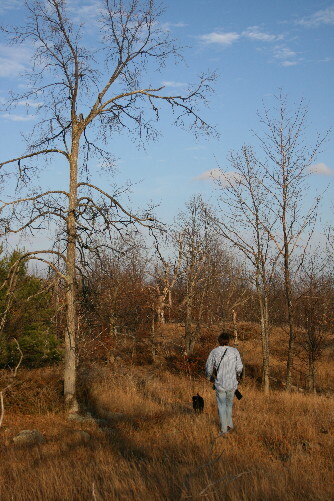 For some reason, most of the areas we walked through had a sparse understory. It wasn’t that the understory was absent, just that it was thin. There were small saplings and a few little shrubs, patchy wildflowers and vines, but generally it was pretty easy walking. I know deer inhabit the park, so it may be that they keep the understory thinned out. Or, it may be something to do with the soil, or some other factor. 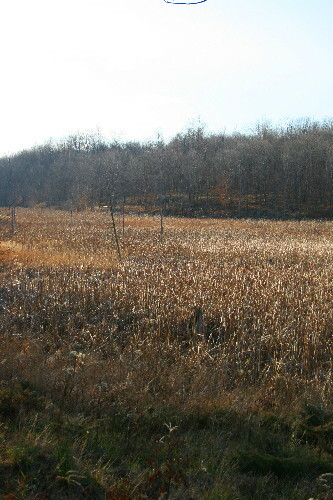 Our “final destination” (meaning, the point where we decided it was getting on, and we were getting tired, and we should start heading back) turned out to be a large, old swampy wetland. 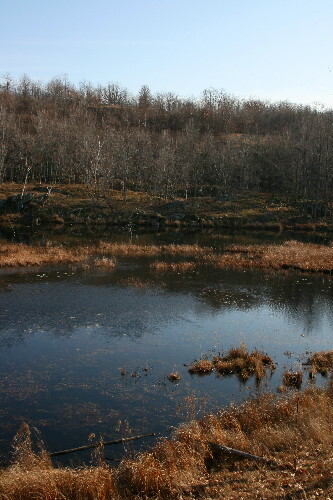 It looked like it may once have been a river, but had been dammed by a beaver and flooded, killing the resident trees. This would have happened quite a while ago, as most of the trees were long dead and fallen. 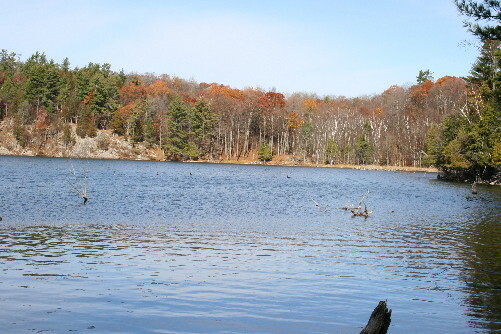 Also, the water level wasn’t maintained, and while it appeared the water was probably high enough to form a continuous lake in the spring, by this time in the fall it had dropped substantially, such that the ground was mostly moist with just small patches of water remaining. Raven, eager to continue on, bounced down and into the wet area to check it out. She paused when it was apparent we weren’t following. She was very good about not getting carried away, and coming back to us when called, with the exception of one spot where her nose found something deliciously intriguing buried in the soil, and she required some coaxing to be drawn away from it (even then, it didn’t come down to us going and picking her up, which I was worried about having to do during the hike – either to take her away from something, or to carry her back when she got tired). During the hike we came across lots of things that grabbed my interest. I didn’t spend a lot of time paused to examine anything, but did snap photos of the stuff that really caught my eye. One was this frog. I’ve encountered a number of different species of frog here, the most numerous at our house being Leopard Frogs. 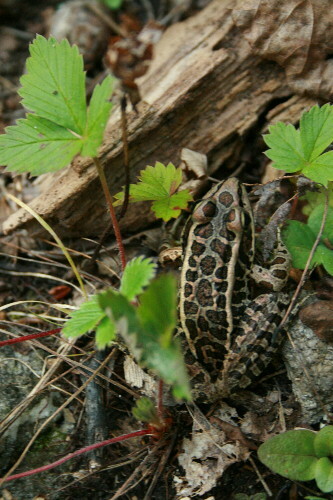 In the forest, during the hike, the most common were Wood Frogs, I must have seen at least half a dozen of them. But as we came down to the edge of the water, in the muddy wet bits, Blackburnian spotted this guy. I spent a lot of time debating its identification. The tight, squareish nature of the spots on its back and sides made me think Pickerel Frog (a species I admittedly have never seen), while the fact that there were three rows of spots on the back wasn’t a feature of this species. Apparently the definitive feature is bright yellow to the underside of the legs of a Pickerel Frog, but I didn’t think to pick it up. I’m thinking now it might just be a very dark, strongly-marked Leopard, but it may remain a mystery. I loved these ferns, which were abundant thoughout the park. 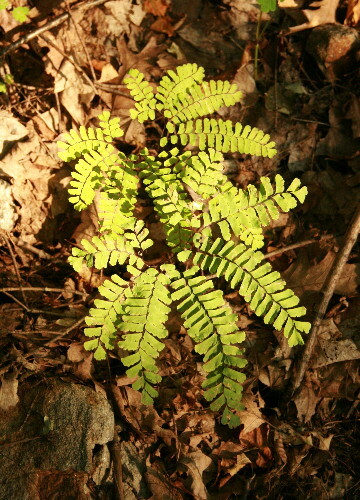 The circlet of leaflets recalled to me a crown, and I thought perhaps it would be named something reflecting that, but the species is Northern Maidenhair, Adiantum pedatum. I don’t recall seeing them at my parents’, or in that region of Ontario, but it’s very widespread, occurring from coast to coast, and from as far north as Alaska and Labrador down to southern California and Georgia. Most of what I was paying attention to, though, was fungus, which will be the subject of the next post. As we turned for home, the sun’s rays started slanting low and golden, illuminating the trees with rich light. 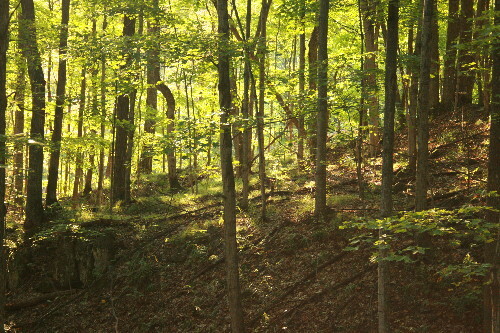 A forest that is cool and shady during the day, when the sun is shining straight down on the canopy, becomes aglow as the sun sinks toward the horizon. Our house, at the end of the day, as viewed from the park; the only reason I knew I was looking toward our house was because of the barely discernible pale line created by the trunk of the big aspen at the shore. There’s so much more to explore, but it will have to wait for another day. Home beckons, with cold drinks and a place to put your feet up.